Go ahead. Make a deal with the handsome devil. Spend some time with the incorruptible witch. And enter the kingdom of Edmonton (outside London), where the Faustian bargains devised by Jen Silverman for her bloody brilliant play, “Witch,” are at once in the classic soul-selling tradition of Western literature, and fitted out with just enough feminist firepower and rage (spiced by a hint of Margaret Atwood) to make them feel of this moment. 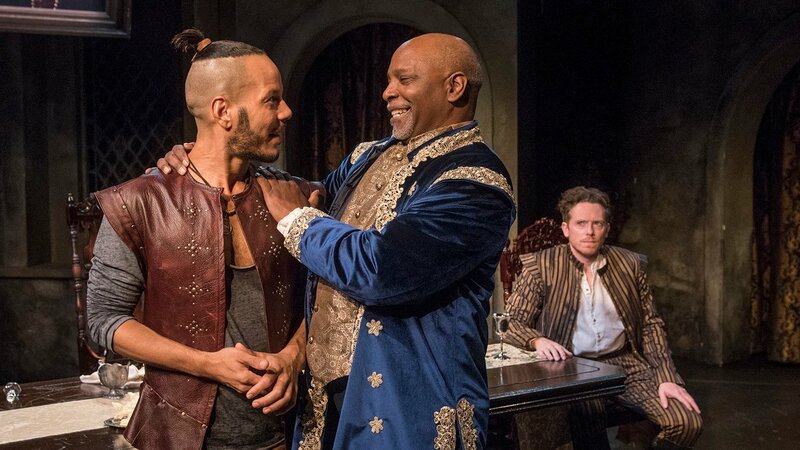 Now receiving an altogether riveting world premiere production at Writers Theatre, with a cast of six bravura actors under the superb, airtight direction of Marti Lyons, “Witch” is a pitch-black fairy tale for our times, and one that is not to be missed. In fact, it might just be the sharpest and most bewitching piece of work about the relationships between men and women and fathers and sons, as well as the whole notion of masculinity and the plight of women, now on a Chicago stage. Awash in incisive dialogue that is alternately biting and seductive, it also includes one brilliant dance sequence (the work of choreographer Katie Spelman, with a remarkable performance by actor Steve Haggard), that is as eloquent as any soliloquy. For the source of her play, Silverman has turned to an early 17th century drama, “The Witch of Edmonton,” penned by William Rowley, John Ford and Thomas Dekker. But her newly minted telling of that story feels entirely fresh. An exceptionally clever hybrid, it includes turns of phrase and attitude that could easily have found their way into coverage of a particular Supreme Court appointment of recent days. At the same time it suggests that human nature, and the inequities of power based on gender and social class, have changed very little over the centuries. Elizabeth Sawyer (the “witch” of the title), speaks first, and is played by the petite but fierce and brainy Audrey Francis in the latest of her many steely yet vulnerable portrayals of women who have been wronged. In a prologue laced with just the right level of bitter sarcasm she describes her status as a reviled outsider in her hometown – a woman who for no reason (or one we will only learn later) is treated like the proverbial “plague of locusts,” and blamed for everything that goes wrong among its inhabitants. And then there is “the king,” Sir Arthur Banks (David Alan Anderson, at once arrogant and insecure), whose formidable wife, now dead, is captured in an elegant portrait that hangs over the massive banquet table where he dines lavishly with his son, Cuddy (Haggard), a Morris Dancer and closeted homosexual, and Frank Thorney (the ideally self-promoting Jon Hudson Odom), the macho, chip-on-his-shoulder son of a peasant family who has won the favor of Sir Arthur, and is hell-bent on assuring that he will inherit the kingdom by providing him with the heir Cuddy seems unlikely to produce. There is just one small problem: Thorne has already secretly married his childhood sweetheart, Winnifred (played with a fine mix of pain and strength by Arti Ishak), who serves as the maid to the king, and is treated as an all but invisible convenience by him. Enter Scratch (the easily charming, charismatic Ryan Hallahan), a “middle management level” devil with a well-practiced gift for enticing people to sell their souls to him in exchange for certain life-altering favors. He soon manages to seal the deal with both Frank and Cuddy. But the worldly-wise Witch is a very different matter. She is an unusually tough sell – a woman of intelligence, experience and cynicism who will not be scammed, and who takes pride in being the mistress of her soul. She will not settle for the usual things – power, money, revenge, security or love (though the latter is very tempting). Though an “older woman,” the devil is so beguiled and challenged by her that he begins to “work off the clock,” and clearly there is a potent chemistry at play between the two as they open up to each other in a most winningly written and played scene. Not surprisingly, the Witch has a backstory, and what she wants in exchange for the soul she will not easily barter is downright apocalyptic. Silverman has packed a great deal into 95 spellbinding, tragicomic minutes that explore the complex and often disparate desires and expectations of men and women, at the same time it conjures a recognizable despair over the current state of civilization as a whole. And the exemplary actors here spin such a tightly contained spell that you wish it would continue. Matt Hawkins’ tour de force fight choreography (fearlessly performed by Haggard and Odom), is counterpointed by that one gorgeous Morris Dance of exorcism. And Yu Shibagaki’s darkly beautiful, richly textured palace set (lit by Paul Toben), Mieka van der Ploeg’s subtly updated period costumes, and Mikhail Fiksel’s sound design are uniformly impeccable. The devil, as it turns out, has the final word. But then doesn’t he always? “Witch” runs through Dec. 16 at Writers Theatre, 325 Tudor Court, Glencoe. For tickets ($35-$80) call (847) 242-6000 or visit www.writerstheatre.org. Running time is 95 minutes with no intermission.